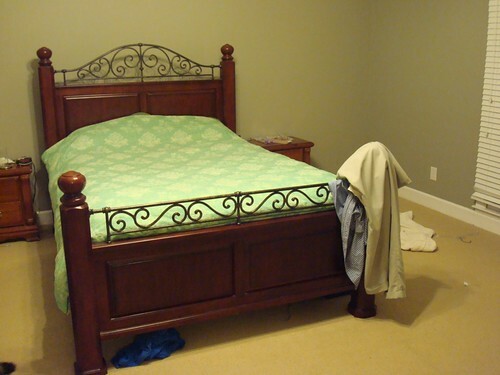 The other day, in attempting to describe the color combination of our bedspread and walls I realized...I had no photos of the bed in our new bedroom. Tonight I attempted to remedy that. Which didn't work so well, I'll really have to wait for natural light to get it right. But what you can see is our beautiful, wonderful, soft, cozy, nest of a bed. I've never had a problem sleeping (for reading) for hours, and this bed happily encourages those habits. Really, the only bad part is leaving it.